This concludes this week’s series of discussions of C. G. Jung’s The Red Book, and completes the birds of prey nature series I have observed here on Turk’s Mountain. I have now completed my first review of The Red Book, concluding this series with the final section “Scrutinies”. I mention here for completeness that the editor utilizes many footnotes to help explain certain references and other events going on at the time in Jung’s life. In “Scrutinies”, Jung confronts his new found soul, “his I, his nothingness”. An extensive conversation including biblical characters and his “shadow” is provided. Who is it that actually confronts his soul – this fast talking voice is Jung’s ego (in my opinion). Perhaps this is meant as a metaphorical prop; however there is no evidence of this. It would seem that his ego found the soul, but has no intention of turning any control over to this voiceless spirit. I am surprised by the level of biblical references found in the book. I had always thought that Jung was more spiritually-focused outside of religion. But unless there is some hidden sarcastic methodology at work here (I see no evidence of this) Jung seems deeply rooted in biblical tradition. In fact it would appear he is trying to utilize it to his own purpose. It is unclear to me why this work would be considered to be an awakening, or spiritual finding. It would seem that Jung has clearly found his egoic mind, and is quite captivated by it. Perhaps, to the psychology student, this may explain some new basis of Jung’s theories and methods. But to the spiritual seeker, it is more of a cautionary tale of someone in search of his soul choosing to stay in the false clothing of his egoic mind. Although he speaks of peacefulness, Jung continues to speak in the tortured voice of someone still lost within himself. I see no evidence of what we might expect – joy, happiness, grace, or peace. He seems still rooted in his egoic mind world of words, words and more words. While I still feel that this is a masterpiece of its time, this work is deeply disturbing to me and with no happy ending in the rear-view mirror, I feel exhausted or even used up by the effort of completing this book. I will now put it aside and decide whether to reread it in a few months to try to gain a better perspective. A symbol of peacefulness, patience and good fortune, this long legged, ungainly bird is actually regal in its flight. As it flies high in search of its next fishing area, it captivates the imagination as something prehistoric. In fact, the entire bird category is the closest surviving relative of the dinosaur. 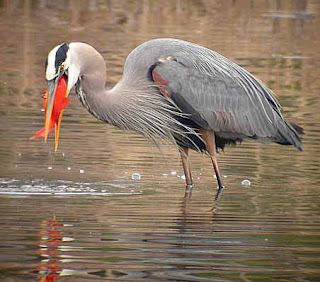 There is nothing more stunning than to see a heron slowly wade through the water patiently looking for its next meal. As it catches a small fish and then tilts its head back on its long throat, we see a masterful hunter at work. At our pond herons would appear every day. I have never seen a heron rook (communal nesting area), as the heron is particularly shy. I have heard stories of these secluded communal areas where the young herons are raised together at the same location for hundreds of years. These are very special places that deserve careful consideration for maintaining their privacy. When I used to actively farm in southeast Pennsylvania, the common egret (the heron’s smaller, not-shy cousin) would appear in the dozens at hay cutting time. They would follow me grabbing large insects, mice and snakes. Typically, it was quite a feast to witness. 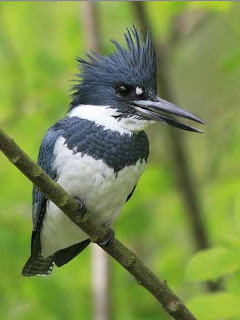 This blue-grey, expert fishing bird (11”) with the distinctive crested top, can be found up and down the larger streams around here. I tend to see them at the same places, as if they have favorite perches. They will hover over a stream and then dive straight down to catch their meal of small fish, frogs, salamanders and crawfish. Although I have never seen their nest, it consists of a long tunnel (up to 8 feet) dug in a sand or gravel stream bank.